The new Neubauer Family Collegium for Culture and Society creates a destination for collaborative humanities and social-sciences research. Law School scholars assess last week's Supreme Court ruling on the Affordable Care Act. One of the city's top modern art collections is hanging right in our own backyard. 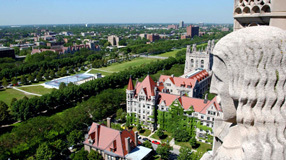 Three leading molecular-level researchers will join the new UChicago institute. A UChicago study of cultural building projects finds that the need to keep up with expanding attractions accelerated the Art Institute’s addition. After two tumultuous weeks, University of Virginia trustees vote to reinstate President Teresa A. Sullivan, AM'72, PhD'75. Assistant professor Roberto Gonzales addresses misconceptions about the people affected by President Obama halting deportations of undocumented immigrants who were brought to the US as children. Chicago Booth economist Steven Davis says that, unlike previous recessions, the most recent struck productive workers in the prime of their careers. Charles Wheelan, PhD'98, discusses how licensed professions can exclude skilled employees. 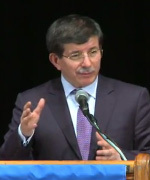 Turkish foreign minister Ahmet Davutoglu speaks at the Harris School. 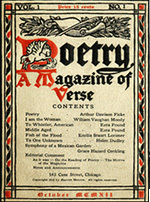 As Poetry turns 100, take a look back at the back-and-forth between Harriet Monroe, her readers, and aspiring writers.